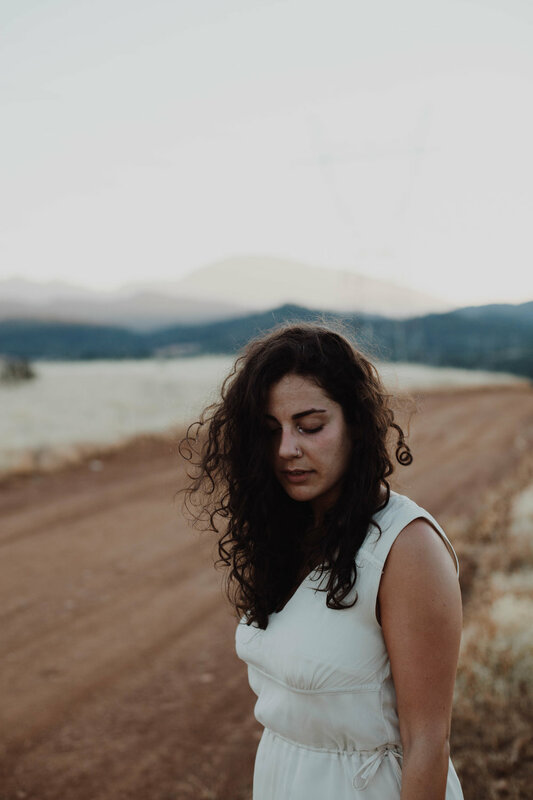 Hope Stroupe, who goes by the artist name Elizabeth Hope, is a 23-year-old worship leader, singer, and songwriter born and raised in Franklin, TN. Her EP “Hidden” releases Nov. 2 -- a collection of songs born from the pursuit of intimacy and identity in quiet, hidden places. She is peaceful and gentle, but she is also powerful, a stunning force with a voice that could move mountains. Hope's humble journey of self-exploration and acceptance with the Lord is encapsulated in her songs and evident onstage whenever she leads. What is your background faith? I grew up in a very spiritual, charismatic family. Both of my parents were musical and performance majors, and my dad was a worship pastor. I grew up around music and church. I like to think I’ve always been pretty connected to my heart and very okay with freedom in spirituality. What is the connection between identity and intimacy? For me, the connection is honesty: identity is being honest with yourself and intimacy is being honest with others. We’re the most ourselves when we’re around people we’re intimate with, the people who see us at our worst and still call us beautiful, the people who see us at our best and celebrate that or aren’t intimidated by that. With the Lord, the closer and more vulnerable you get with him, the more space he has to speak truth over you. One of my favorite questions to ask the Lord when I’m in situations where I want to react instead of respond is “What is most like me in this situation?” He is always so kind to respond, because he knows me best. What challenges have you experienced with intimacy and how did you overcome them? My biggest obstacle has been coming to terms with my disappointments — or rather, my hopes about my life, myself, my family, and my dreams. It’s really funny that I’m named Hope because it’s always felt kind of like a curse. Hope is something I’ve really struggled with. I could never be honest with myself or God, let alone my community, about what I was hoping for, because I was so scared of being rejected or being let down. Admitting you’re disappointed is really vulnerable because it points to what you were hoping for. It’s supposed to hurt less when you don’t talk about it, because then nobody knows when it doesn’t happen. But it’s just as painful because the hope was still there in your heart, whether you voiced it or not. So you might as well voice it with your inner circle so they can rejoice with you in desires fulfilled and encourage you when things don’t turn out you wanted them to. What’s one tool for dealing with disappointment or building hope? Gratefulness. One thing I started a little over a year ago is based in something called “Emmanuel journaling.” I start my journal time by listing off all the things I’m thankful for, all the little things. Then I wait to hear God’s response back to the thankfulness. Appreciation puts you in a different mindset. Since starting this a little over a year ago, I’m able to savor little things. Once you learn to appreciate the small things in life, the big ones are icing on the cake. That’s what life is — it’s just a bunch of little things. What has been your greatest tool for unlocking intimacy? Getting real with God — and then slowly but surely letting your closest friends into those dark places that you'd rather keep locked away. I did a school of ministry in Canada, and one of the greatest things that I came away with is that it's okay to be angry with God. He can handle your disappointment. He can handle your crippling fear. He's not looking for perfect people, just ones willing to lean. From there, watch how he meets you. Practically that can look like a lot of different things. Something I would do while I was at the school was throw empty bottles at a wall. Just get really expressive. Scream into a pillow. Get it out — then allow the Lord to meet you there. Some of the most powerful life changing moments for me have been when I've been incredibly disappointed, ashamed and angry at myself and let it all hang out — and then chose to be brave enough to let him comfort me. It can be really easy to stuff your emotions or to spill it all out and leave it there. But I think the true test is giving him space to talk back to the pain. I wasted a lot of time just emptying my basket with God and not allowing him to talk back. You can imagine I stayed just as bitter. There's truth in what we've experienced, but we don’t always give God the space to speak the whole truth. You’re currently in a relationship. What has the Lord taught you through this season of dating? One of the most valuable things the Lord’s taught me about is partnership with him. He's not looking for slaves or robots that have to be told everything all the time (which is generally my default). He's looking for sons and daughters willing to be part of the family business. That involves having dreams of your own and then asking God about what he thinks. I'm a huge advocate for the power of community, sharing your heart, and asking for wisdom from mentors. But it's really important to learn to go to God first. God is perfect and his truth is perfect. If we aren't getting what we need from him first, then we're going to be looking for it in a significant other. He's the best person to learn partnership with, so by the time you get in a relationship with someone you'll be adding to it instead of sucking it dry. How do you relate to the Lord through worship and song writing? I feel most like myself when I'm singing and worshipping. I feel closest to God because when I sing because I feel his delight. I know I'm in my divine purpose. There's moments where I know I was made for this and I'm exactly where I'm supposed to be at this point in time. I get caught up in the sound of the music, the awe, the tenderness, and the wonder. I see that when you lead. It seems like you lead from a place of security and knowing who you are. I’ve learned to perceive that he’s with me and he’s glad to be with me. I still get really nervous — but then it tends to go away. I’ll get these pictures right when I start, like the Lord is standing in front of me and just kissing my forehead, and then I'm good. Of course, there have been sets in the past I felt didn't go as well as they could have. I remember one specifically where we had to stay up for communion, and I was feeling like I wanted to go crawl into a hole. The voices in my mind were saying everybody is probably looking at me and thinking what a terrible job I did — and I just had to stand there with my rejection and shame. And the Lord said to me, "They're not looking at you, Hope. They’re focusing on me, which is where they should be." I just had a moment of realizing how shame like that can be so selfish — it’s actually robbing God of what he's worth. What has the creative process taught you about relationship with the Lord? The biggest thing it's taught me is that it's not one-sided. I often process things with God through songwriting. It looks like me coming to him with an idea or what I'm struggling with. As I write, sometimes the answers come — and sometimes you really have to work at it. Sometimes if I'm lucky, the inspiration would hit and I'd write a song in 45 minutes that I was really proud of. But that relationship isn't always sprinkles and rainbows. There's a give and take. Sometimes it's amazing and sometimes it's a lot of work. You have to sit and wait and press through. It's sacrifice, it's commitment, it's dedication, wonder, joy. Can you talk a little bit about what that experience of leading worship is like? It goes back to perceiving that he's with you. Doing life with someone is doing life with someone -- they're there in the present. Oftentimes we're trying to connect with God on some holy level, as if he's up there and we're far down here and we've got all this space to make it to him. For me it's tuning in to where he's at all the time and following your imagination. That’s not just music, that’s my whole life -- just realizing that he's there. He's not just there when I'm songwriting. He’s there when I'm driving to work, when I'm grocery shopping or making breakfast. You begin to see all the little things that happen throughout the day as little kisses from God. What have your creative pursuits taught you about identity? I don't need to be anyone but myself. I used to spend so much of my time comparing myself to other people and other people's creative process. And of course I never measured up to them, because I wasn't I wasn't made to be them. I learned to take responsibility for the “Hope-shaped” spot in God's heart. With that, the happier and more like me I became. Leading up to the release of my project, I was getting so anxious, thinking “This is going to make or break me,” and “This sound is going to be me for the rest of my life." I was so stressed out about what genre it would be, whether it would be good enough. And the Lord reassured me that the music is just the wrapping. Your heart is the gift. Wrapping always changes, packaging always changes. But your heart stays the same and that's the gift. It took all the pressure off, because for this project the music reflects the journey I went on, but that doesn't mean that is what I'm stuck with for the rest of my life or that that's going to be my whole music career. What is your creative expression with God look like? It doesn't have to be like anyone else's or be what's deemed acceptable or cool. My relationship with him has to be mine. There’s no formula. It's an adventure you go on together. Something the Lord asked me when I was in massive distress about the project was "What would it look like if you shared this project with people and you weren't ashamed?" I think that's what intimacy is. It's coming before the Lord unashamed. We're so worried, myself included, about being rejected that we show people what we think they want and miss out on the beauty of intimacy — which is coming before people unashamed and finding out that we're enough. What's the story behind your EP? Three years ago I moved home to Tennessee from Toronto, not really wanting to. I had no plans and literally no hope for my future. I felt like I was back where I didn't want to be, where I felt like everybody was better than me. My friend and I gave each other prophetic words for the year and she told me, “I feel like the Lord's asking you "Will you trade your plans for my presence?”"
And that became this journey in which worship was all I had. It was the only thing that kept me sane. Waking up to a day when I had nothing, when I had nothing to do, I’d just go in my kitchen and sing and cry and worship. God was really faithful to meet me there. That's the foundation for this EP -- things that I was struggling with and asking the Lord what he had to say about it. It's called “Hidden” because it came from that time in my life where I didn't really feel seen… but that's not always a bad thing. In that time, I also learned that being hidden doesn’t necessarily mean that you can’t be known by your community. There’s actually a song on the album that’s written by a couple of people. Which song on the EP is most connected to your heart? I'd pick two for different reasons. “Whisper” was the first song I wrote that I was actually really pleased with and felt like it was totally God speaking. It's all about the Lord saying “I've been looking for you." I was looking for these big signs saying "Do this, Hope!" I wanted a plan. The song alludes to that verse -- He wasn't in the fire. He wasn't in the wind. He was in a little whisper. The chorus goes, "And little did I know, it's in the stillness that I find you, Lord. In the quiet of your sanctuary, I hear you whisper." For me, it's about intimacy. You have to stop and quiet everything to get close enough to hear a whisper because you can't be far away and hear someone whisper. You have to be really close. That was the groundwork for the EP-- everything's built on intimacy first. We're often looking for a really obvious blatant plan and he just wants to spend time with us. The other is "Home." I thought I had all the songs for the EP, and I was trying to make last minute decisions on the last song. None of the ones I was considering felt right to me. I had written a lot of songs but nothing was fitting. So I sat down and literally this song came in one night. It's special because it's like that “last hurrah.” The chorus goes, “Oh, so sweet to look back knowing that you had a purpose in it all. All that's lifting from my lips is a song of thankfulness knowing who you are." I love those moments where everything just clicks. Looking back in hindsight, it all makes total sense that he had me move back home and go through that season. I’m better for it. I'm really glad it happened. I'm so, so thankful. I’ve caught a different part of God I would’ve missed if I didn’t go through that season. What is your hope for this EP? I can remember other albums and think back to times where specific songs were like the promises for that season or the only things getting me through something. For me, if my music can be that for someone else, that’s good enough for me. Obviously, I would love for it to do well. But the purpose was never to make marketable music, it was to share my story and encourage others in theirs. More of Elizabeth Hope on Instagram or her website. To listen to or purchase singles & the EP after release, visit Spotify, iTunes/Apple Music, or Google Play. Locals are invited to a party celebrating the release of the EP on Nov. 2, including a listening of the EP & a live acoustic performance by Elizabeth Hope. Purchase tickets here.